My father, brother and I participated again this year, along with about 170 others the weekend of 30 June. Already on Friday evening, the focus of this year’s hike on Tibetan refugees was made clear. A panel of Tibetan and Chinese refugees discussed their experiences, and a short documentary movie showed the plight of young children, sent by their parents across the Himalaya into India to receive education they could not get in their homeland. 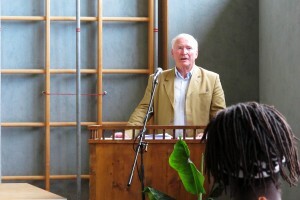 Ernst Löschner, founder of Alpine Peace Crossing, speaks at the Krimml Peace Dialogue on the eve of the Alpine Peace Crossing. 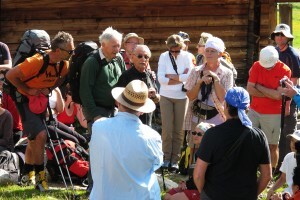 Saturday morning we set out from the Krimmler Tauernhaus, where the Jews had received good treatment and nourishment before they set out over the Alpine passes in the summer of 1947. The beautiful valley there lies around 1600 meters above sea level, and we went up a side valley towards a pasture, where we stopped for a break. There, the refugees who went with us (about 15 from all over the world) briefly told us their stories – where they come from, why and how they fled to Austria. Some of them have been in Austria for 8 years and still have not received a final decision on their asylum status. Marko Feingold, born in 1913, tells a part of the story of how he helped smuggle 5000 fellow Jews across the alps in 1947. Like in previous years, we were also joined by Marko Feingold, the 99-year old President of the Jewish Community Salzburg who was one of the main organizers of the 1947 operation, which had to be conducted mostly illegally and under the cover of night. Marko is an exceptional person and shows an amazing perseverance – not surprising for someone who was the first Austrian to be brought to Auschwitz concentration camp. He spoke about the 5000 Jews’ motivation to flee to Palestine, the later Israel: They had been displaced during the war; most by the Nazis, some by the Soviets or simply by a local populace with an opportunity to get rid of the Jews. None of them were welcome to return in peacetime, and a move to then-Palestine, whether motivated by Zionism or not, was their best attempt at a normal life. The cross was already there when we arrived, but we added the Tibetan prayer flags. When we reached the pass at 2634 meters, those refugees whose asylum proceedings were not yet completed had to stay behind because they are not allowed to leave Austria. We crossed into South Tyrol, Italy after a short Tibetan mountain ceremony. The first town on the Italian side is Kasern, where we spent the night to return on a slightly different route the next day. 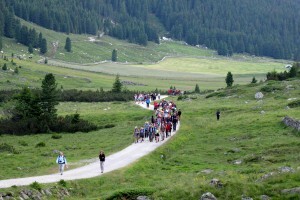 The whole group (~170 people) hiking through the Krimmler Achetal valley. 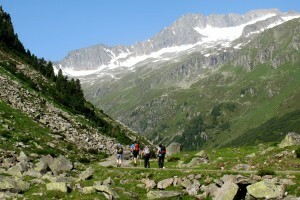 Alpine Peace Crossing is a great hike through stunning landscape. 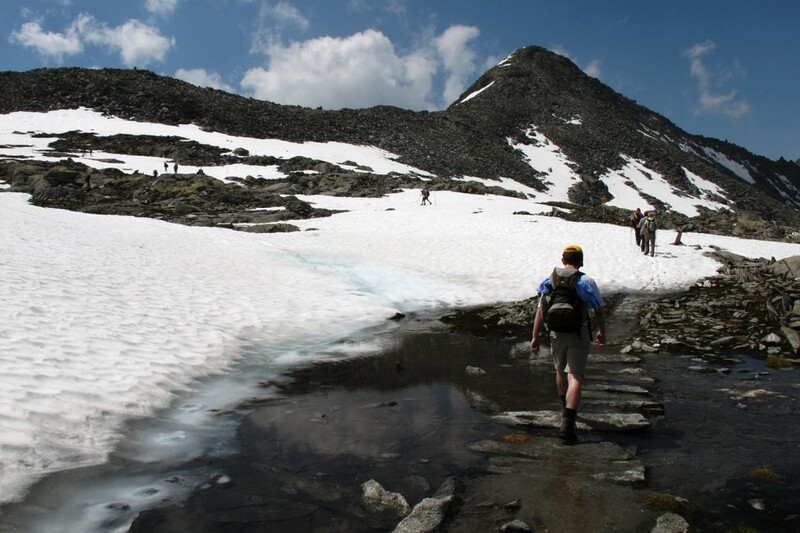 However, as we walked across the snow fields, we were reminded that the Jews who took the same route did not have high-tech hiking boots, that many of them were old, infirm, pregnant, young children, and so on. Refugees today face the same and even more perilous adversity. That they take this risk already tells us about their motivation. We should embrace and welcome them while we attempt to rid the world of the injustices that made their flight necessary. 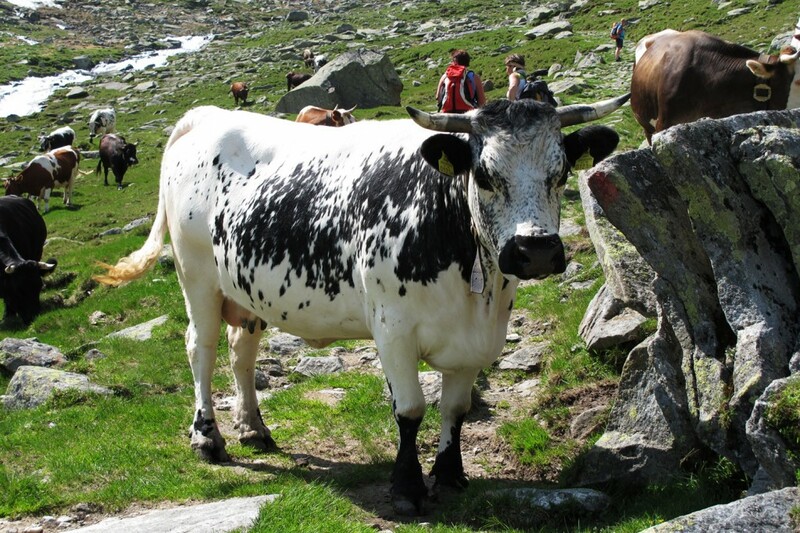 We saw many beautiful cows along the way – and some yaks! 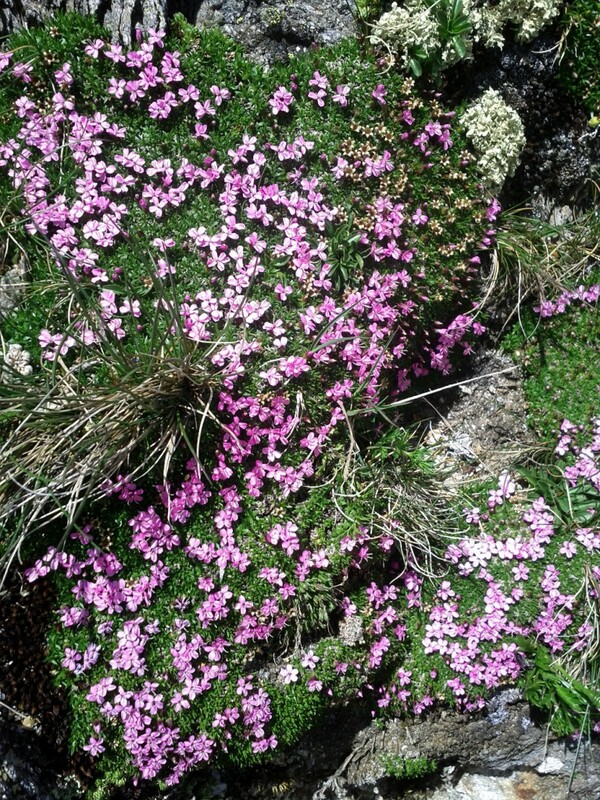 Beautiful flowers grew all the way to 2700 meters above sea level. Snow and water are ubiquitous in Windbachtal. Every few steps there is another little stream of water. My brother Andreas, just below the pass. 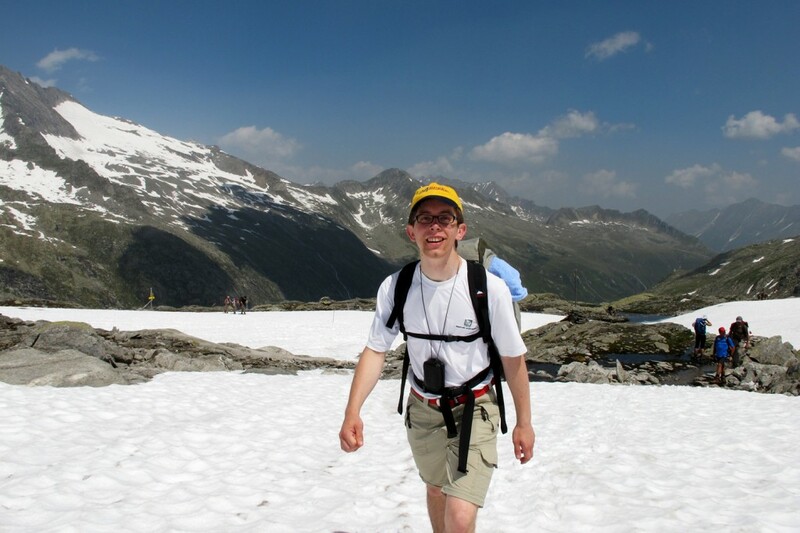 Hiking on snow just below the Krimml Tauern pass. 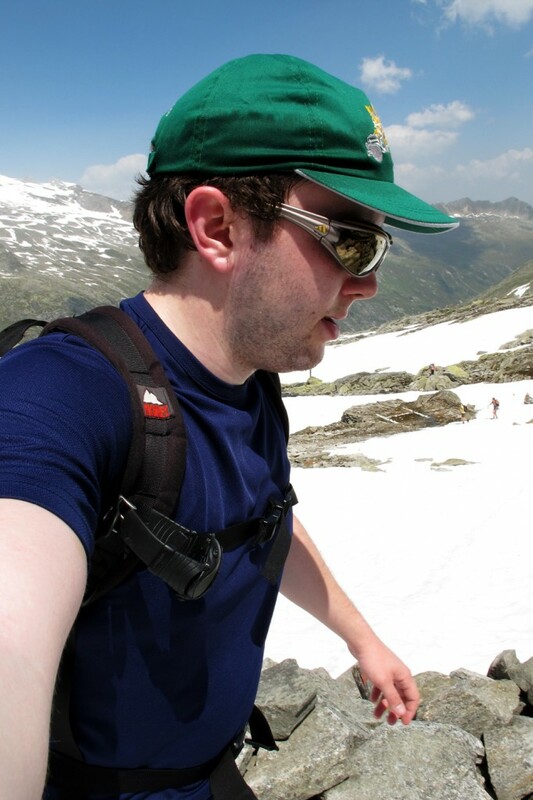 This entry was posted in Personal and tagged apc, austria, hiking, Salzburg by Florian. Bookmark the permalink. A stirring journey and wonderful photos. 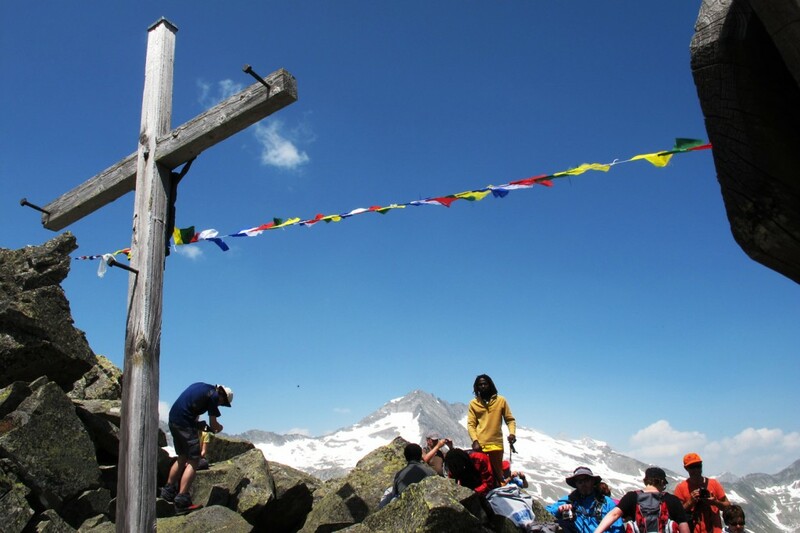 Thank you for posting details of your journeys over the Alpine Peace Crossing. May I reproduce some of your pictures for a story I plan to write about the APC? If so, how shall I credit them?